See the possibilities during a tour and in our Welcome Home Magazine. It’s best to experience a Real Smart Home yourself, in person. See what it’s like when the Loxone Smart Home is taking care of simple tasks for you. In our Loxone Showhome, intelligence and convenience come together so you live more comfortably in your home. We have created a space just to open our doors to you. So come on in, and also be sure to download our new Welcome Home Magazine to explore even further. Especially with Loxone! In a Loxone Smart Home, the home itself takes care of many daily tasks for you, so there is more time for the important things in life. Together with our Project Partners, we have created the perfect space to showcase Real Smart Home Living in all its glory. Let the Loxone Showhome fill you with inspiration for your own project. The hub of the Showhome is the stylish living area. Upon walking in, the room fills with music and ambient lighting that flows through to the spacious kitchen, breakfast nook, and family room. On dark and chilly days, the home automatically turns on the fireplace casting a cozy and warm glow over the family room. The plush sofas make it a comfortable and inviting place to relax after a busy day. With just one click, the room can bring on the perfect lighting mood for a leisurely read, a lively party or a thrilling evening of TV. The Showhome features different lighting moods throughout. When you walk into the Showhome, an ‘everyday’ lighting mood turns on and you are welcomed with music. When you are cooking, the lighting above the kitchen island will shine brightly. At the touch of a button or by simply tapping on the app on your smartphone, you can change between lighting moods. With music, subtle lighting and a comfortable temperature, the bedrooms in the Showhome are welcoming for all our guests. Whether you are there to work or relax, you can set the mood with lighting and music at the touch of a switch. A triple-click on the Touch pure beside the bed then activates night mode. 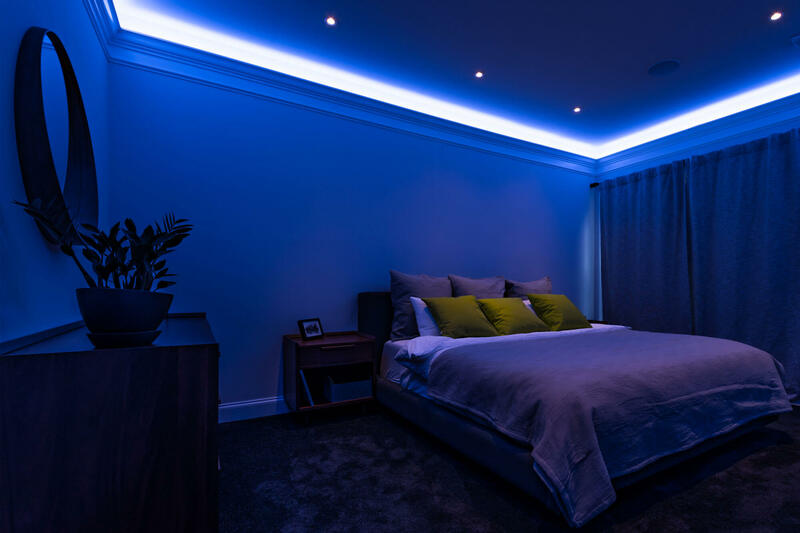 If you then get out of bed in the middle of the night, just the right amount of lighting comes on to highlight your path to the bathroom, so that you aren’t left dazzled by bright lights. The lights will then fade off when you are back in bed. It works just as you would want it to. You can easily set your own alarm using the Loxone Smart Home App. Choose to be gently woken up with your music of choice and favorite color lighting. When you step into the bathroom, the music, lighting and ventilation are automatically activated. However, if it is the middle of the night, the music doesn’t come on and a dimmer lighting mode is activated. Soft lighting then guides your path back to bed. Thousands of tasks around the house being taken care of for you. That is a Real Smart Home! In the Loxone Showhome, rooms come to life with different lighting moods. The lighting in the Loxone Showhome works together to create the perfect atmosphere for whatever the room is being used for. Completely change the way a room looks using the various lighting moods. The lighting moods suit the mood, whether it’s for a romantic dinner for two, subtle indirect lighting while watching TV, or colorful lighting to get the party going… Give it a try for yourself! Did you know? Violet light supposedly increases concentration! Why not set up your own learning atmosphere? The Loxone Smart Home sets the perfect temperature throughout the house, room by room. At night, the temperature changes in the bedrooms to offer a perfect night’s sleep. During the day, the comfort temperature is set in the family room. Another neat feature: The fireplace will switch on automatically when someone enters the room and it’s dark and the temperature is below 40°F. Our Real Smart Home also includes an intelligent alarm system, alerting the residents to any dangers. The fire alarm isn’t only active through the smoke detectors. It alerts all residents to a possible fire in many ways. The lights begin to flash, the escape route is illuminated and notifications are sent to all the residents’ smartphones. A warning announcement is made over the speakers and the blinds are opened to make the house transparent. Burglars have no chance up against the Showhome. After a certain period of no one being in the home, the Showhome automatically arms itself. If the alarm is triggered, a call is made to the emergency contact, the lights begin to flash, and music is played throughout the house at maximum volume. To protect the home, electrical goods and appliances against water damage, water sensors have been placed in the kitchen, the laundry and under the HVAC units. If water is detected, you will immediately be notified on your smartphone so that they can respond before damage occurs. Guests can gain access into the Showhome using their unique iButton. This can be placed on the iButton reader at the front door, which then deactivates the alarm and unlocks the door. If the intercom outside the front door is rung, then a chime will play in each of the rooms, except in bedrooms where ‘night mode’ is active. From your smartphone, you can then see who is at the door, speak to them, and even unlock the door for them. 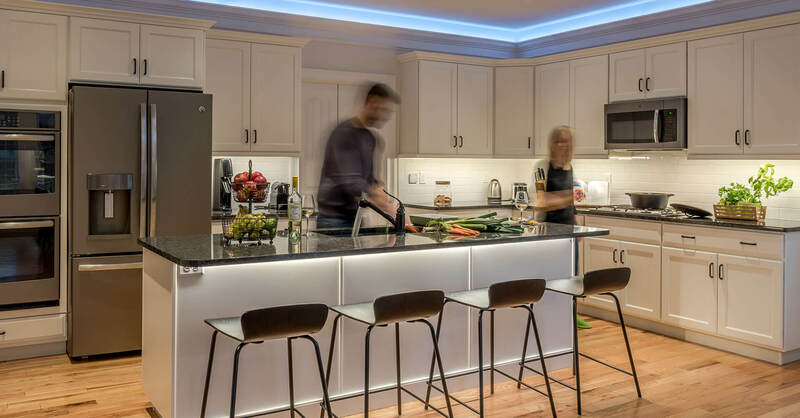 We now have space where a Real Smart Home can be showcased in all of its glory. We will give you a personal tour through our Loxone Showhome via Skype, Facetime or WhatsApp Video where you can immerse yourself into the world of Loxone and answer all your questions. Pick a time that fit’s you best and our friendly team will get in touch with you. 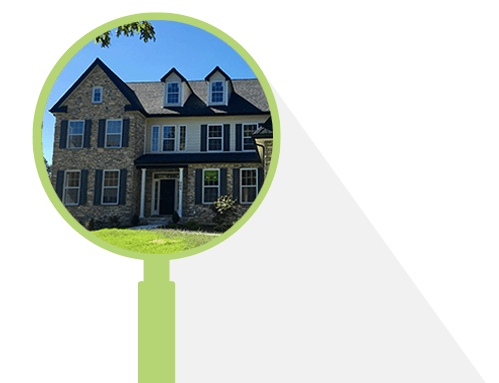 Do you want to know more about Loxone Smart Home? Download your free brochure now! Want to experience a Real Smart Home? We’re happy to show you in the way that works best for you! Visit us at our US headquarters, take a tour at a Loxone Partner Showroom or take a video tour. Leave us your contact details and we’ll contact you to schedule a tour.